Name a nesting turtle – Each season we see dozens of individual female turtles and while they have flipper tags, we like to give them names to remember them better as the season goes on. For example, SPP056 is one of our special turtles. She nested twice in 2016 and one of our team members, Dana, named her Rapunzel. After her second nest though, she was attacked by a shark as she got back in the water and we didn’t see her again that season. We thought we may have lost her. But to our surprise (because it’s unusual for leatherbacks), she nested again in 2017 and was one of our champion nesters! No lasting impacts from the shark attack. For a $100 donation to the Sea Turtle Census Initiative, you can name a nesting turtle. 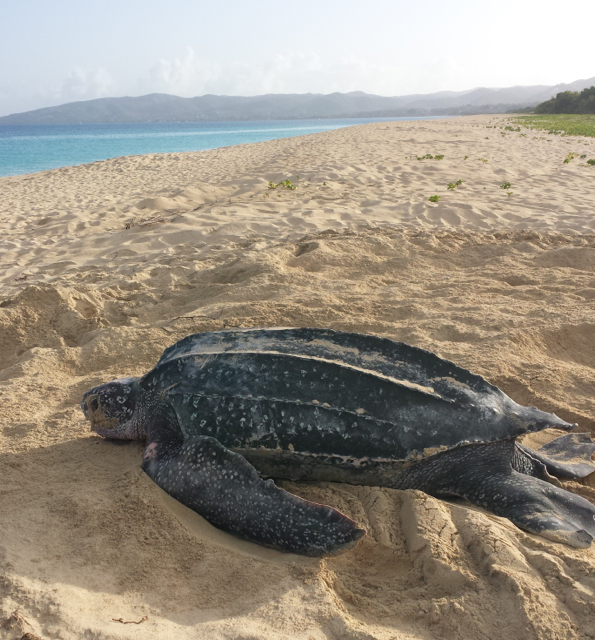 You’ll receive an adoption certificate to print, a leatherback project T-shirt, a sticker, recognition on our website, a notification each time your turtle nests and a summary at the end of the season with her stats (# of nests, dates seen, etc.). To name a turtle, go to the following link, enter your information, and in the Comments box, add the name you’d like along with who you are naming it for. Name your turtle for 2019! We will be in touch with you right away to make sure the details are correct for your certificate. Still plenty of time to get an adoption for the holidays! A leatherback turtle returns to the water after nesting at dawn. Eighth Day of Turtles – 2018 Supporter Shoutout!